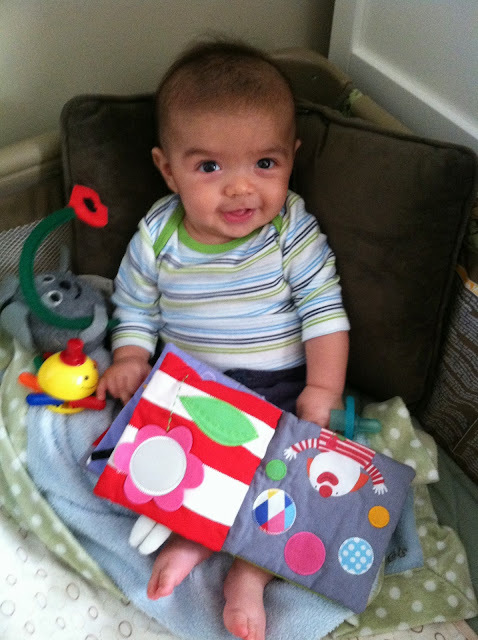 It's never too early to cultivate a love of reading in our little ones, right? Here's a few of the soft books and book inspired toys we have at our house. Most of these have been passed on from Stephen to Rockam and now to Oliver. Fredrick Plush Toy - I found this dreamy little mouse (the title character of Leo Lionni's fable about the importance of imagination) in a bookstore in Taipei a decade ago before I was even thinking about having children. I did a search online and couldn't find him. Oliver likes to grab the stalk of the poppy and fling him around, but I suspect he might not be the sturdiest toy for babies, as the felt facial features might come off if chewed vigorously enough. Leka Cirkus Play Book (IKEA)- I like this little cloth book because the size is tinier than most. The color scheme is simple and each page features some kind of surprise, like a mirror or a bunny to pull out of a hat. 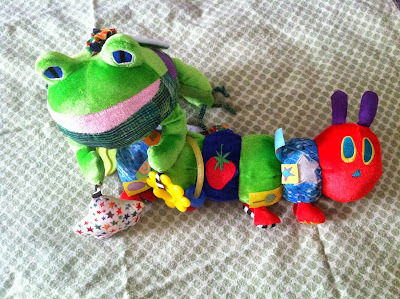 Eric Carle toys by Kids Preferred - The Very Hungry Caterpillar is a great book and this toy follows suit. Because of it's long shape, the littlest babies can sit in an infant seat and chew on one end while the other rests in their lap. Other toys often end up on the floor right away, but this one's shape seems to make it easier for the immobile to manage. It includes a squeaker in the middle strawberry and different plastic crunchy sounds in the feet, antennae and body segments. The Frog hides a "Ribbit! Ribbit! Ribbit!" sound box in the depths of its belly, causing Stephen to christen this toy as "Agg-Ack Agg-Ack." However, most kids won't be able to apply the pressure needed to activate the sound, unless they sit on the toy. This might be a good thing, as the noise is a little annoying for adult ears. For some odd reason, Blogger insists on making this photo of our Roger Priddy cloth books upside down, but I think you get the idea. These are great tactile books for older babies. Our copies have endured many car rides, though I will say that the plastic crinkle paper in the cover of Fuzzy Bee and friends melted on our summer road trip to North Carolina a few years ago. It still makes crunchy sounds and, like a shrink dink, fills only about a third of the page. The insides of the books contain simple rhyming verse and manipulative creature features.